Three spreads to adjust to the load- Outside spread- Middle spread (outside less 1’)- Inside spread (outside less 2’). 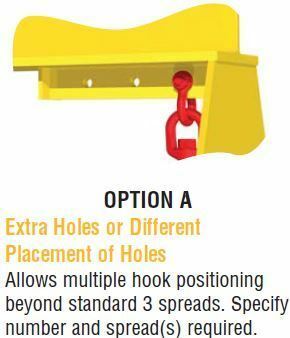 OPTION A: Extra Holes of Different Placement of Holes - Allows multiple hook positioning beyond standard 3 spreads. Specify number and spread(s) required. 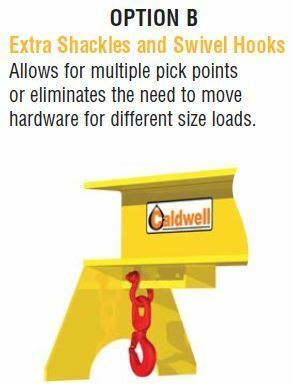 OPTION B: Extra Shackles and Swivel Hooks - Allows for multiple pick points or eliminated the need to move hardware for different size loads. 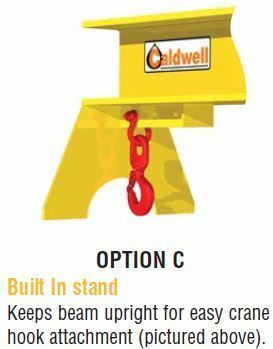 OPTION C: Built In Stand - Keeps beam upright for easy crane hook attachment (pictured above). It is our goal to continually enhance and expand all of our product lines to provide our customers with a complete line of lifting products from one source. We do this through a continuous and aggressive research and new product development program. Over the years, we have increased our product offering by developing new solutions to both complex and common material handling applications. From our three adjacent manufacturing facilities in Rockford, IL, we produce 9 unique product lines. Strong-Bac® - Below the Hook Lifters – Items include lifting and spreader beams, roll lifters, coil lifters & upenders, sheet lifters, pallet lifters, rotating crane hooks, and lifting tongs. Mill Duty – Heavy & Severe Environments – Custom designed and manufactured to be utilized in heavy duty and many times severe duty environments. The designs encompass specific criteria to comply with ASME design category B, service class 3 or 4. Posi-Turner® - Load Rotation Equipment – The Posi-Turner® is a patented, ergonomically designed material handling system for the lifting, suspension, rotation and positioning of objects in almost any application. Univac® - Vacuum Lifters – Designed for efficient one-person, virtually damage free lifts of semi-porous and non-porous material. Rig-Release® - Remote Releasing Hooks – The patented Rig-Release® load releasing hook will allow users to set loads – and then – quickly, efficiently and safely release the rigging from a safe distance. Rig-Master® - Rigging Attachments – Geared towards riggers and construction applications, this line includes clamps, grabs, and tongs; pipe and manhole handling equipment; load leveling slings, lifting and spreader beams, container lifting lugs, bucket hooks, bucket forks, and synthetic sling end fittings. Lif-Truc™ - Fork Truck Attachments – Helping to expand the versatility of one of the most common tools in the industry, our Lif-Truc™ line includes booms, beams, rams, extensions, work platforms, pallet puller, pipe lifters, trailer spotter, and battery lifting beams. Krane-King® - Jib and Gantry Cranes – A complete collection of steel and aluminum portable gantries, free standing jibs, tension and cantilevered jibs, and the required hoist package solutions. Caldwell® - Slings and Tie Downs – Lifts can be large or small; heavy or light; bulky or fragile, applications of lifting slings are truly unlimited. Synthetic slings can lift items that require careful handling such as expensive machinery, highly finished parts and fragile loads. Mesh, rope and chain slings can handle pipe, steel wood or any item that is not finished. Our experienced and dedicated staff can assist you in providing your customers with a complete material handling solution. Caldwell’s engineered lifting equipment offers the broadest range of products in the industry to give you flexibility to address your particular application requirements with the economy of a standard product, and at the same time our engineers offer innovative solutions to applications that require custom design.